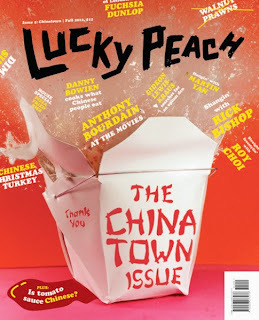 The "Chinatown" issue of hipster food magazine Lucky Peach just hit the stands, and a combo article by moi is in there. Called "The Beginner's Field Guide to Dim Sum," this introduces the history behind one of China's most gracious contributions to human civilization. This elegant definition of afternoon sloth around the dining table is none other than the glorious Cantonese tradition of enjoying a dim sum meal in an endless relay of tiny dishes. The article then breaks form and segues into an actual field guide replete with detailed line drawings on the best of the best dim sum, replete with their backgrounds and contents and the occasional weird story. The featured 24 delectable culprits have contributed to the delinquency of many a food tourist who wandered into a Hong Kong or Chinatown teahouse one day and was never quite the same again. If you relied only on the cover, you would never know that I was in there in a spread that stretches across eleven pages. No, I am not famous enough for that. I sob quietly as the likes of Anthony Bourdain, Fuchsia Dunlop, Martin Yan, and Danny Bowein bask in the limelight. But to be fair, a tiny slice of "Dim Sum" can be seen to the immediate left of the Lucky in Lucky Peach, so I guess I qualify as sort of a walk-on role here in a major crowd scene. If you do get your hands on a copy, please check out the article by the brilliant Harold McGee on "酒餅," which means jiubing, or Homemade Fermented Rice. Highly recommended. "Nowadays, the terms "dim sum" (點心 in written Chinese and pronounced dianxin in Mandarin) encompasses a vast roster of small dishes selected from carts (rather than ordered from menus) in Hong Kong-style restaurants that serve little else during the daylight hours. "Around the year 1300, dianxin turned into a noun that referred to snacks and very light meals, a definition that has more or less remained unchanged to this day. In the entry for dianxin in every authoritative Chinese dictionary, this always appears as a complete term that cannot be reduced and thus defined according to its individual characters. What this means is that rather than translating to 'dot heart' or 'touching the heart' or 'a little bit of heart' -- which is what these characters mean separately -- the term dianxin refers solely to snacks and so has nothing to do with the heart at all, much in the same way that in English a 'cocktail' has no feathers..."
When you get to the actual field guide, be sure and read about Steamed Pork Buns, aka char siu bao, for "in Hong Kong, char siu bao suffers a reputation like that of hot dogs in the U.S. -- it's thought that any mystery meat could end up inside, even human. This urban legend was memorialized in a bloody 1993 Hong Kong movie called The Eight Immortals Restaurant: The Untold Story...."
Both ink drawings by Carolyn Phillips,copyright (c) 2012; all rights reserved.